The Elmhurst History Museum is hosting a fun activity for you and your children (6 years and older) to exercise their creativity at the Family Cartooning Workshop. This hands-on workshop, which will be held on Saturday, April 14, from 2-3:30 p.m., will be led by Mark Anderson, a professional cartoonist and the creator of Andertoons. He’ll inspire children to come up with their own cartoon themes and then explain how to bring those ideas to life. At Elmhurst Toyota, we think creativity is a great outlet for youngsters, and you can share the fun of cartooning with them. In the Family Cartooning Workshop, Anderson will relate how he comes up with the subject matter he’s going to draw. Cartoons are often humorous, so Anderson will let his imagination roam freely into silly subjects. For example, one inspiration for a cartoon was what a raccoon would order in a restaurant. Anderson will help kids come up with funny cartoon topics and demonstrate some basic cartoon drawing techniques. Another important aspect of cartooning is telling a short story or conveying a joke with words and pictures. What will the finished cartoons look like? Sign up for the Family Cartooning Workshop and find out! Advance registration is required, so make your family’s reservations now. All children must be accompanied by an adult. 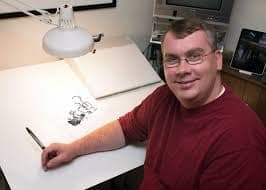 Cartoonist Mark Anderson has loved cartoons since he was a young child and discovered that he had a talent for drawing them. His work appeared in both his high school and college newspapers. While he worked full-time jobs during the day, he continued cartooning in his spare time. He submitted his cartoons to various magazines and they started to sell. Eventually, Anderson was able to quit his day job and draw cartoons for a living. His work has been featured in magazines such as The Wall Street Journal, Women’s World and many others. He also has a line of greeting cards. Anderson and his family live in the Chicago area. We hope to see your family at the Family Cartooning Workshop on April 14! April 14, 2018, 2-3:30 p.m. Admission is free. Register online at www.elmhursthistory.org (under the Family Programs section) or call the museum at 630-530-6879.